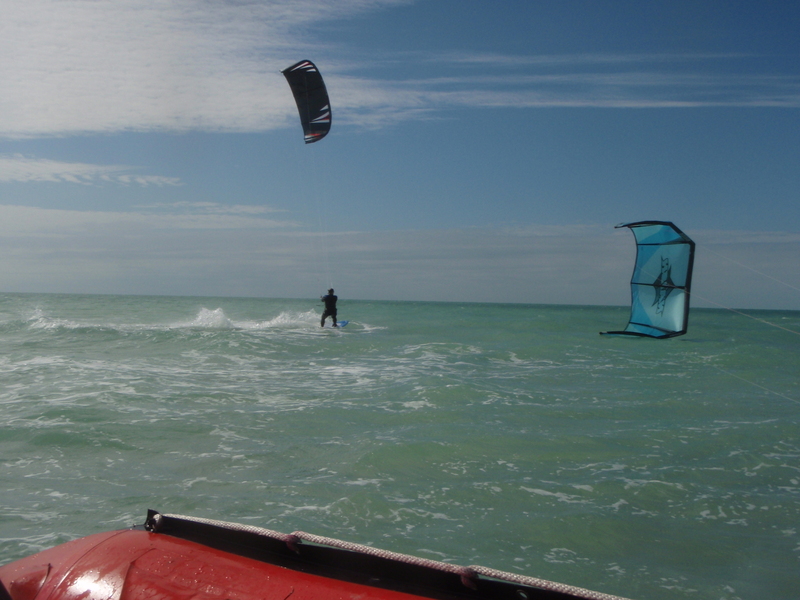 I‘ve been lucky enough to go down to Key West Florida twice and go kiteboarding with two different outfits. This past February I went to Key West with my wife and in-laws and had an awesome time riding with Jake from Sunrise Kiteboarding. Jake is from Michigan and spends his winters giving lessons and taking people via boat to kiteboarding destinations in they keys. First let me say that if you’ve never been to Key West or thought about going there you should put it on your list even if you’re not planning on kiteboarding. There is world class fishing, snorkeling on the worlds third largest reef, and a carnival like sunset celebration every evening at Mallory Square. Key West has an amazing selection of restaurants and really great happy hours. Our favorite happy hours are Alonzono’s on the wharf from 4:30-6:30(1/2 off drinks and appetizers, try the Mojito’s and buffalo shrimp! ), Kelly’s from 4:00-7:00(1/2 off appetizers and well drinks, best hot wings on the island and they make their own micro brews), and Turtle Kraals from 4:00-6:30 ($.50 Oysters, 1/2 off drinks -good selection of bottled micro brews and imports, and appetizers). There is nothing better than going out for some cold brews during happy hour after spending all day kiteboarding on the water. If you have a family there is plenty for them to do while you spend the day ripping up the buttery smooth water of the keys. There were three kiteboarders booked with Sunrise on the day I went out. Jake who runs Sunrise had us meet him at the Cow Key marina on stock island. Stock Island is just to the east of Key West and is about a $25 cab ride(each way) from the Duval street area. You could also take the bus lines if for a much lower cost but it will take longer to get there. Luckily I had a rental car but if you don’t have one then ask Jake if he’d be willing to pick you up from Key West. Once we had our gear loaded into inflatable boat Jake asked us where we wanted to go. He offered a variety of locations but said the best spot is off on the Gulf side of Snipe Key called Snipe Point. He said it was about a 40 minute boat ride but well worth it because the you can ride waves from the Gulf or head into the cove to ride the flat water. We all agreed that was where we wanted to go and headed out. Half way there we were lucky enough to come across a pod of dolphins. Jake cut the engine and we got a great look at these amazing animals before making our way to Snipe Point. We arrived at Snipe around 10:00 AM. As promised it was a beautiful location and offered a variety of conditions to please any kiter. When the tide is out there is a very nice sandy area in the middle of the cover where you are able to setup and launch from. As we were setting up the tide started coming back however and we had to move our gear to higher ground to keep it from floating away. No worries though, in short time we had our kites launched and were enjoying the best the Key’s have to offer. Jake had with him a strapless skim board, a fish surf board, and a 132 twin tip. I started out on the skim board and headed out towards the gulf. This was my first experience on a strapless directional board and it was fun but also a challenge. 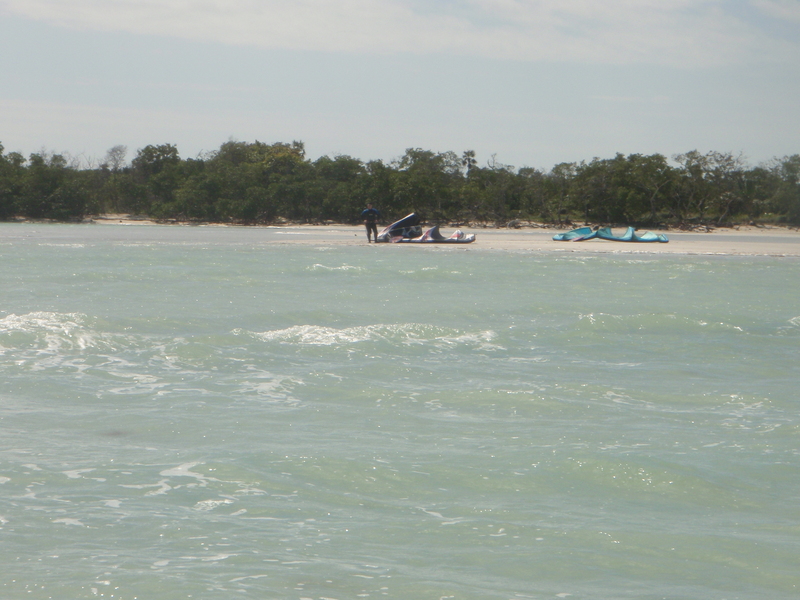 I was finding it hard to stay up wind and spent some time walking upwind in the knee deep water. 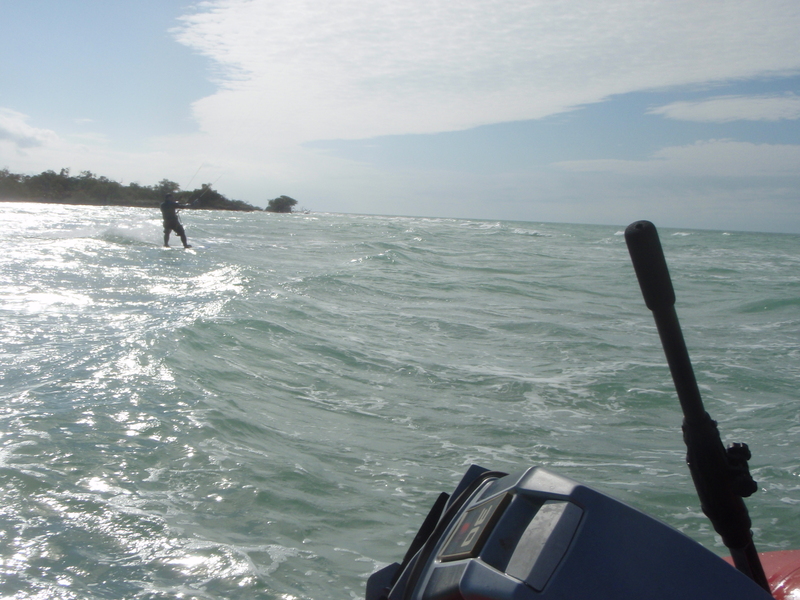 I was having a good time heading out towards the waves and slapping them around a bit. The other person who was riding along was having a difficult time on the twin tip because he didn’t have quite enough wind so I traded off with him. This is the kind of riding that I’m used to. I was just starting to rip it up and then realized my kite was jellyfishing a bit and thought it was probably losing air. Good thing I brought it down because the plug had come off of the main inflation valve. When I was ready to get back out again Jake needed to use the twin tip for lessons so I got on the directional surf board. The directional surf board was also a new experience for me. I was having a difficult time jibing and riding toe side which made it hard to stay upwind. I had one successful Jibe that made all the failed attempts worth it. It was fun to try out a surf board and I definitely want to do it again this summer. Late in the day I got back on the twin tip. The wind had picked up a little more and was probably around 18 knots. I was getting some good rides when I noticed Jake had gotten out side camera to take some shots. As I was riding by out towards the Gulf he motioned for me to go up in the air. I think I got way too excited to boost and went up awkwardly. My board came off and I went sailing and came down hard in knee to waist deep water. My heel struck the sand pretty hard and I knew that I was done for the day. In fact I had to rent a bike for the rest of the trip in Key West to get around the island and be able to stay with the rest of the family. Needless to say with my bruised heel I wasn’t able to ride any more the rest of the week but it didn’t blow any more the rest of the time I was in Key West so I didn’t miss anything. All in all it was a great trip and I highly recommend Sunrise Kiteboarding to anyone looking to have a good time in Key West.